How To Get Rid of Cradle Cap? : Cradle cap is one of the most common skin problems noticed in babies. It is a yellowish, scaly patch that appears on the scalp of newborn babies, sometimes also found on eyelids, the area around ears, forehead and eyebrows. Cradle cap is completely normal and non-contagious, but it usually makes new mothers suspect it’s harmlessness, wanting them to get rid of cradle cap once and for all. So here at HNBT, today we bring these tips to get rid of cradle cap for you! 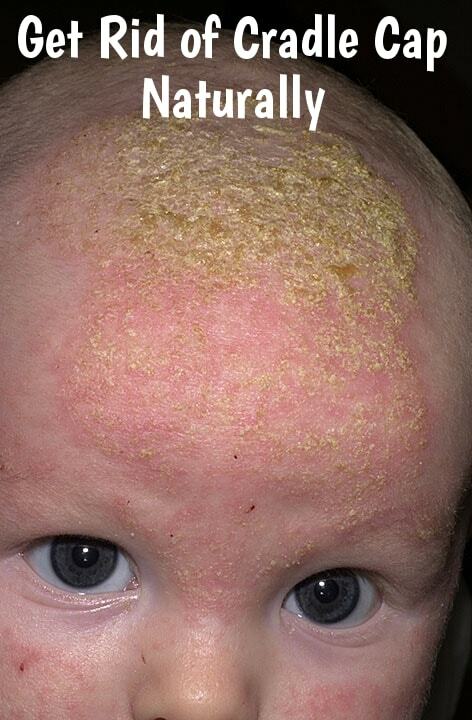 Cradle cap looks like inflamed skin which is caused by a fungal infection. It can be due to the antibiotics that is given to the mother before a child is born or hormones that are passed on by the mother. The other possible causes are over-stimulation of baby’s oil glands, non-favorable weather, reactions of baby’s skin to lotions and creams, and other skin disorders like the growth of yeast in the digestive tract. Before you see your pediatrician, the following are few safe, mild home remedies to get rid of cradle cap. 1. Get rid of cradle cap with olive oil: Apply some olive oil to the baby’s scalp, and massage it so that the oil spreads through the hair as well. Leave it on overnight. The next morning, gently rub the scalp with the help of very soft comb or a soft towel. This will loosen up the scaled up skin. Wash it off as usual with baby shampoo and warm water. Repeat this process every alternate day for a month to get rid of cradle cap completely. 2. Get rid of cradle cap with coconut oil: Coconut oil is well known for its antibacterial and antifungal properties and is safe to use on babies. Apply coconut oil on your baby’s scalp and leave it overnight. Shampoo and wash as usual the following day. However, do not overdo with the coconut oil dosage, just a teaspoon should do the trick. Must read : How To Get Rid of Cystic Acne? 3. Get rid of cradle cap with shea butter: Shea butter is an effective home remedy to get rid of cradle cap. Shea butter gets absorbed in baby’s skin without leaving any residue or any greasy feeling. Apply shea butter on the affected area. Let it sit there for few minutes. Scrub it off gently with a washcloth. Also read : How to Get Rid of Dandruff Naturally? 4. Get rid of cradle cap with mineral oil: Mineral oil is a great emollient that helps to soften the skin just enough, for the cradle crap to be removed easily. It also helps in moisturizing the skin, thus preventing further formation of cradle cap. Apply mineral oil to the affected area and leave it overnight. Wash it off while scrubbing the scalp gently with warm water. Follow this process regularly for two weeks to get rid of cradle cap. 5. Get rid of cradle cap with almond oil: Almond oil has amazing healing properties that can help soothe and rid cradle cap. Almond oil is also great for moisturizing the skin and scalp, thus preventing dryness and relieving the skin from irritation and redness. The trick is done by the high Vitamin E and D content found in almond. Apply almond oil to the affected area, massage gently and let it sit for 10-12 hours before washing off with warm water. Repeat this process daily for a month. 6. Get rid of cradle cap with Vaseline or petroleum jelly: Vaseline is definitely one the simplest and safest methods to get rid of cradle cap. Apply Vaseline to the affected area and leave it overnight. Scrub off the skin gently with a comb or a soft towel the next morning. 7. Get rid of cradle cap with baby shampoo: Mix some baby shampoo with warm water. Massage baby’s scalp with this mixture. Let the shampoo soak for a few minutes. Wash it off with warm water and scrub it off with a soft towel. Repeat this every time you wash your baby’s scalp until it’s completely gone. 8. Get rid of cradle cap with tea tree oil: Tea tree oil is a wonder ingredient that helps in several skin ailments. But however note that tea tree oil is quite dense to be used directly over baby’s scalp. Thus, always make sure to dilute it first with either coconut or olive oil in the ratio of 1:10. Apply this oil mixture on the affected area and leave it on for an hour. Wash off with a mild baby shampoo. 9. Get rid of cradle cap with baking soda: Make a fine paste out of baking soda and plain water. Remember to add more water as baking soda has a probability of causing redness and irritation to baby’s soft and tender skin. Apply this solution on baby’s scalp and let it sit there for few seconds. Gently scrub it off with a wide tooth comb. 10. Get rid of cradle cap with breast milk: This old wives’ tale has been known and practiced for generations now. All you have to do is pump out some breast milk and apply this to the baby’s scalp. Breast milk helps in softening baby’s scalp and pretty effective in treating other conditions such as diaper rash too. Let it sit for a few hours before washing off with mild baby shampoo and warm water. Be gentle while combing baby’s scalp with cradle cap. Any purposeful or rigid removal of scales can hurt the baby. Use shampoo only meant for the baby and be careful to not to let it enter the baby’s eyes, ear, nose or mouth. Use a gentle brush to scrub off the residues of the scalp. Brushes meant specifically for newborns are widely available in the market these days. Make sure you have them handy before using any of the above-mentioned methods. Always oil your baby’s scalp before shampooing, even after you have gotten rid of cradle cap, as it provides nourishment and prevents further settlement of sediments on the scalp. Always sterilize the comb and use a clean and fresh towel for the baby to prevent the spread or development of more infections. Consult your family doctor if the symptoms persist for more than a month. Do let us know how these remedies and tips worked out for you. Leave us a comment too about how you liked this article. it has been really great to study this content. it is really helpful. thankyou for submitting such a awesome content.